This painting is $65 and is available HERE. This is another nameless mug shot from 1900. This one is from my home town of Victoria, so I have actually walked the same streets she walked … well, not exactly. At the end of September we went to Victoria. September weather is usually pretty reliable and this was no exception. We had a few beach days with the girls. Scarlett is totally into the beach right now. She would throw rocks in the water and scoop water into her sand bucket forever. 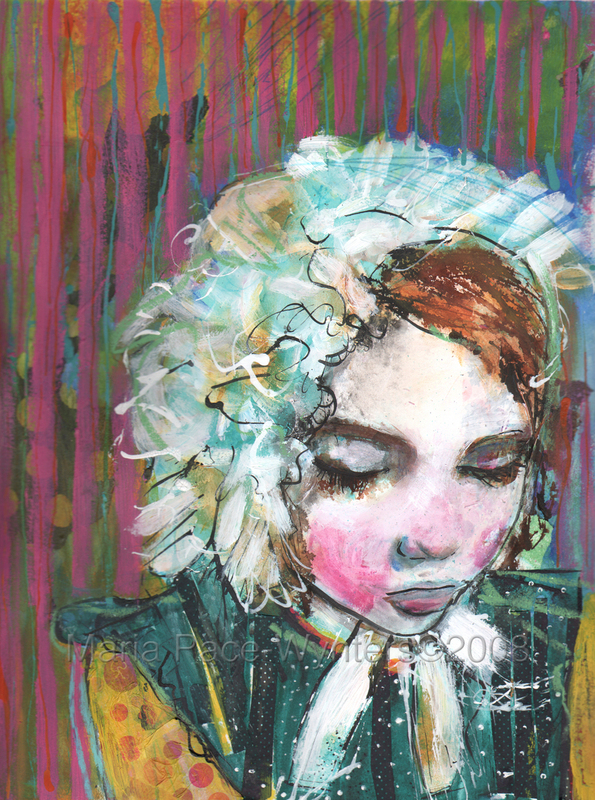 This is an original 2.5″x3.5″ mixed media piece on 100% rag paper. 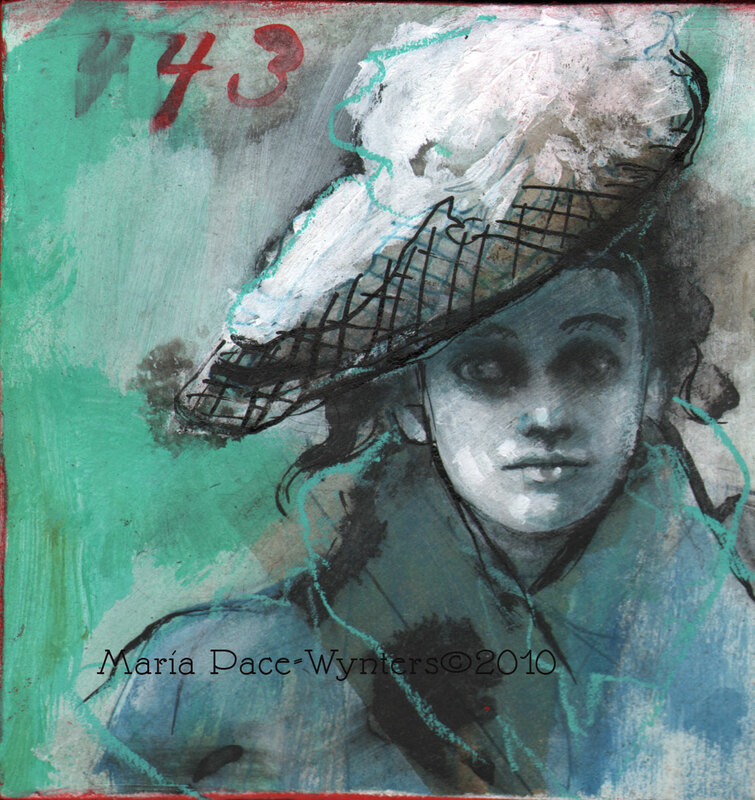 This is a 2.5″x3.5″ original mixed media painting on 100% rag paper. We had to make a hard choice today. We’ve decided to not go to Victoria for Christmas. I know it is the smart choice but it makes me a little sad. This painting is of Imogen who is already thinking about what she wants for Christmas and even warned Scarlett (the two year old) about Santa’s ever watchful gaze during a melt down she had today about getting dressed! What is Imogen she wishing for? A basket for the front of her bike. Decorative and practical. It is only mid summer so I am sure there will be plenty more wishes by December. Geesh. We are flying off to Victoria tomorrow. Going ‘home’ for a little visit. I can’t believe I’ve lived in Edmonton for over ten years. That is so crazy. And more than a little sad… you see, I love Victoria for so many reasons. I was born there, which is a tie but my brother in law was born in Germany and I don’t think he is longing to get back. It is more than where you are born and it is even more than where all your family still live, although that is a huge draw. I always thought it was the Ocean that was calling me back or the view of the mountains but that is not it either. I think that I have finally figured out that it is the familiarity of it that I love. I know it like the back of my hand. Everywhere I go I have been, in some form or another. Even if the shop is new, I know the building or the building before it or even the land before that. I know it. I feel so comfortable there. It really is like being in the comfort of your own home. I have never been able to find that comfort level in Edmonton, it is like I am always looking over my shoulder. In Victoria, I never have to look, because I already know what is there.